Today I will be looking at the youngest son of Edward Marden Jr. & his wife Elizabeth Annis. Perhaps this review should not be titled “Quick!” This turned out to be long enough to make 2 or 3 good length posts, but I’ll leave it intact. 9-Apr-c1825 – born in Lunenburg, VT. His brother, Joseph, gives us the birth date of April 9th but the year is missing in the Annis Genealogy. Someone online has it listed as 1818, but no source is provided. 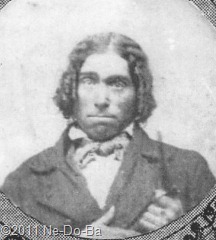 Census ages suggest he was born about 1825 plus or minus a year. His grave stone says 1826. A friend of mine was researching in Lunenburg and checked the actual town records for me, but found nothing for him or his children. bef 14-Sep-1850 – Chapin and Mehitable “parted after a few years of married life” according to Riley H. Marden. He goes on to tell us their daughter, Ann, was adopted by Chapin’s sister, Rebecca. I found 2 year old Ann with Rebecca in the 1850 Census. Did Mehitable really abandon her child? 20-Sep-1850 – Chapin and Mehitable “Martin” are listed without any children at Danville, VT together in the census. He is a shoemaker. 30-Aug-1852 – marriage to Bertha B. Call at Hatley, Quebec. Chapin is referred to as a “mechanic”. 8-Apr-1856 – birth of son Rinaldo Renaline in Brompton, Richmond Co., Quebec. 1861 – living in Barford, Stanstead Co., Quebec age 38 with his family. He is a laborer and born in Lower Canada living in a 2-story framed house. 1870 – living at Colebrook, Coos Co., NH. He is age 46, born in VT, has no real or personal property of value, and works as a “Clock Tinker”. 1880 – his 2nd wife, Bertha is living in Byron, ME with their children. She is listed by the census taker as a widow, but perhaps it should say divorce. 1881 – resident of Potton, Brome Co., Quebec. He is listed as born in the US, a Congregational of Scotch origins, widowed, and now a “Silver Smith”. His children are with him. c1899 – death, perhaps in Weld, ME where he is buried beside his son. This photo was shared with me by a Mardin descendant. I am not sure who has the original. I have a photocopy so the quality is very poor. I have no way to prove it is Chapin, only the word of those who shared it with me. I discovered Chapin’s gravestone quite by accident one day while visiting with friends in Weld. We took the dogs for a walk and I was telling my friend about the family I was research that had ties to her community. As we walked past a small cemetery, the genealogist in me couldn’t resist checking the stones. One of the first stones I looked at was his. It is just so cool (and spooky) when that kind of discovery occurs while researching. There is no doubt this is the marker for Chapin since it is right next to his son, Dr. R. R. (Rinaldo Renaline) Mardin. The marker is too modern to be original and is identical to that of his son. Millsfield, NH – 1876 according to the marriage record of his daughter. Potton, Brome Co., Quebec – resident in the 1881 census. Phillips, Franklin Co., ME – dates unknown but probably later in life. Freeman, ME – dates unknown but probably later in life. Weld, Franklin Co., ME – perhaps here at time of death? The Freeman Genealogy has Chapin listed, but I found most of the info to be incomplete or in error. His birth is given as 1836 which does not agree with census ages. It claims he married Bertha in Hartford, ME but I actually found their marriage record in Ancestry.com’s Drouin Collection in the Georgeville Baptist Church in Quebec. The Freeman Genealogy has only 3 children, Rinaldo, Edward Orlando, & Theresa and does not mention his other wives, where either he or Bertha died, his divorce(s), his occupation, or anything to suggest he spent time in Canada. It does not give his parents or list him as a brother to Nathaniel. Essentially, it provides very little useful information. It does say he lived in Phillips and Freeman, Maine after living in Vermont. I’m afraid I don’t put much faith in this material, but I will include the two new locations it mentions. His unusual name helped me find him in the 1850 Census under the surname “Martin”. I wonder if he was home that day or if a neighbor gave the information? Was Mehitable actually still living with him while her child was with Rebecca or had she already left him? I also checked for him using search engines at GenealogyInTime, Linkpendium, Mocavo, and rootsweb. I didn’t find anything new. I must assume (but really should find proof!) Chapin divorced both his first and second wives. It appears Mehitable ran off leaving Chapin with a toddler who was taken in by his childless sister. Then Bertha is found as a widow in the 1880 Census while Chapin is in Canada in the 1881 Census. The kids are with her in ‘80 and him in ‘81. But where were they really? I have to keep in mind that census takers ask questions and write down answers, but don’t ask for proof of anything. Chappin has some unusual occupations. He starts out rather common. In 1850 he is a shoemaker. Although this is a common occupation, it does require a specific skill set and tools. In 1852 when he married his second wife he is called a “mechanic”. In 1861 he is a common laborer. I wonder way he is not making shoes or fixing things? It would seem to be a better paying job if he was any good at it. Maybe it’s just a census taker’s personal judgment that labels him as laborer. In 1870 he is listed as a “clock tinker”. I really wonder where he learned the skills and acquired the tools for that profession. Not something you find just anyone doing. In 1776 he is called a “tinker” in his daughters record. At the time of his 3rd marriage in 1879 he is called a “watch jeweler”, which is probably the same as “clock tinker”. By 1881 he has progressed even more and is a “Silver Smith”. Now that is yet another occupation that requires specific skills and expensive tools. Perhaps he has natural talents that have taken him through the progression from mechanic to silver smith. Are his unusual occupations what causes him to move around so much? Perhaps, but I should think they would tend to fix a man in one place so customers could find him when they required his skills. Maybe his skills were not needed much in rural areas. Perhaps he was so good at fixing things , he ran out of work after living in a town for too long. All this moving around must have been very hard on his wife and kids. I suppose it could have to do with why his 2nd wife left him. There are other reasons to explain a person moving around so much. If he was constantly in debt he might move to avoid the consequences. If he was frequently in trouble with the law, that might cause a person to move to stay out of jail. I’m sure my readers can come up with a few other reasons. One that comes to mind could have to do with his possible mixed race. If Chapin’s grandmother was Native, he might have suffered from serious discrimination and bigotry directed towards himself and/or his family. Was he perhaps looking for a place that would accept him for who he was? If Chapin’s grandmother was indeed an local Abenaki woman, I could also explain his movements as having acquired her traditional semi-nomadic wandering lifestyle. Wandering just may have been in his blood, keeping him restless, and always moving towards the next resource required to survive. In looking at the map, I really don’t see any pattern to his movements. Except for Manchester, NH the locations are all well within the territory of the Abenaki. The locations are pretty well spread out rather than clustered together in groups. The Quebec locations are scattered and I see no clear connection between them. One is on the St. Francois River just north of Sherbrooke, but Sherbrooke seems like a much better location for someone with his skills. Two are around Lake Memphremagog which is an important Native resource and perhaps had some tourism developing after the Civil War, but probably not at the locations he is found. If he were a guide I would not be surprised to find him here, but not a tinker, jeweler, or silver smith. Most of the NH/VT locations are along the Connecticut River, which is not surprising since his father and grandfather had strong roots along the banks. However, Millsfield and Manchester NH clearly don’t fit within that pattern. Phillips is located on the Sandy River which was an important Abenaki resource with Freeman and Weld not too far away from that same river. There was perhaps some lumbering going on at the time he would have been here, but not much else happening. Very questionable in my mind if there were enough residents to support a “tinker” or “mechanic” and certainly not many who would require the services of a silver smith. On the other hand there was a tourist industry springing up around the Rangeley Lakes Region that arrived there by way of the Sandy River corridor, so perhaps he was able to get a piece of that action. He does have children, nieces, and nephews in the region, so perhaps he lived with them when he could no longer work at a trade. I checked newspaper archives hoping that Chapin may have advertised his skills, but had no luck. To be fair, the most likely places to search would be in Canada, but there are not many Canada newspapers digitized and available online. I would love to have the time and money required to properly research this man in-depth. I think it would be a very interesting project. However, I will have to pass that on to the next researcher, hopefully one of his descendants to get involved. What else should I try to learn about Chapin Kidder Marden? Did he ever own land? Was he ever in trouble with the law? Are there any divorce records for him? Are there any descendants out there that can provide additional information or perhaps have other photos? Feel free to ignore this if it is unhelpful or out of date eith your research- I stumbled across your blog doing research of my own and have become fascinated with your work here! His pattern of marriage looks more “Indian”- esp. with regard to a lack of indications of divorce proceedings. My own research touches upon the pattern of polygyny among Algonquin groups and the survival of the practice well into the 19th century even among “assimilated” folks. (My research question has to do with the connection of polygyny and political power.) Harold Prins' ethnography, The Mi'kmaq may shed some light, and has evidence of a 'practical' type of polygyny that is not a formal marriage, but essentially functions the same, permitting men with itinerant work to have a “home” in diferent communities. CKM's life history seems to suggest this as well- although he may just have “commitment issues” :). Finally, his job and changing title seems suggestive of someone who is learning, and achieving a skill that was valued particularly in the Abanaki community- silversmithing. The clock tinker etc suggest his learning period/assistantship to a Native itinerant smith before becoming one himself. It is unusual for a Euro-American/white person to become a silversmith unless they have undergone training/apprenticeship in a particular shop/with a particular smith. If there are no apprenticeship papers or records linking CKM to a particular smith with an established shop, I suspect he learned from and Indian silversmith and he is catering to a mixed customer base. CKM's timeline coincides with a high point in Penobscot silversmithing and the popularity of silver items among the Wabanaki. As you have noted elsewhere in the site, census data and notations concerning his racial classification are suspect- at the time, it is likely that outside a Native community he would not have been forthcoming about a whole or partial heritage as Indian to a stranger. This is all conjecture of course; I don't know the documents and archives as you do, but I hope I was able to offer at least some other leads that may prove fruitful. Unless I stumble upon something new, I have no plan to go any further with my research of the family. I have tried to leave a trail of bread crumbs and mention the places and things that need further research. It is now up to the descendants to carry on. I do believe in-depth research on this man may be the best place for the family to concentrate there efforts. If anyone in this family was ever labeled Indian in public records, I think it will be Chapin.